We worked with Joseph & Berry Remodel | Design Build to redo our kitchen. We were extremely pleased with the entire process. Joseph and Berry spent several hours with us in advance of the project to be sure that the design process was one we were comfortable with (and came up with some great concepts too!). We also got to meet with all the various teams that would be working on the project (carpenter, cabinets, electrician, painter, etc) so that each person was on the same page. The construction phase went well – the project manager was on-site daily and was great about working to be sure that the job proceeded on schedule. He was also great at pointing out details that we would have missed, and in making sure that the job got done not only on schedule, but with great quality and attention to detail. The whole team, from front office through to the work crews, were very pleasant to work with, and took time to be sure that we understood what was happening, and that we were completely satisfied. We are extremely pleased with the end results, and highly recommend Joseph & Berry to anyone considering them. And, we will be using them again for the next project in the house! We also had the privilege to renovate their master bathroom. 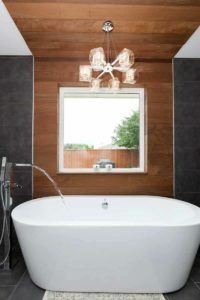 Click here to see their beautiful modern bathroom remodel, Dallas, Tx.